Diabetes is an increasingly common cause of prematurely thinning hair, and is one of the reasons why it is always advisable to see your doctor if you experience unexplained hair loss, especially if you are also more hungry, thirsty or tired than usual. Even if you have been diagnosed with diabetes some time ago, it's possible that you can suddenly develop related Hair Loss problems, so it's important to know what's going on. Metabolic problems – because it disrupts the metabolism, diabetes can interfere directly with the cycle of hair growth and regrowth, so that shed hair isn't replaced as quickly as it usually would be. Nutritional problems – because diabetes can interfere with digestion and the transport of nutrients around the body, hair follicles may not receive the iron, zinc and other key chemicals they need. Circulation problems – as well as interfering with follicle nutrition, these can lead to poor regulation of scalp temperature and delayed removal of toxins, damaging growing hair. Immune system problems – diabetes is often accompanied by immune system disorders that lead to the body's own defences attacking hair follicles. Thyroid problems – diabetes can lead to damage to the thyroid, which interferes with the patterns of hair shedding and Regrowth. Alongside these problems, diabetes can damage the body's repair mechanisms and immune defences, so that you're more vulnerable to scalp infections that damage hair. Minor scalp wounds and bruises will tend to heal more slowly and can lead to hair shedding. Several of the medicines commonly used to treat diabetes and related health problems have the unfortunate side effect of damaging hair follicles. Every individual is different and in some cases this will settle down after your body has adjusted to them, so don't panic if you start to lose hair – unless it's really drastic, wait for a month and see how it goes. Because complications of diabetes can kill you, it is really important that you don't stop taking your medication even if you fear it is causing hair loss. The good news is that there are many different ways to treat diabetes. Your doctor will probably be able to prescribe different medicine for you. With so many ways that things can go wrong, it may sound as if trying to care for your hair when you have diabetes is a lost cause. Don't despair – there's actually a lot you can do. The first and most important thing – which sounds obvious but which a lot of people don't do – is to take your prescribed medication on time and take your dietary restrictions seriously. This is important because getting out of sync can interfere with longer term metabolic cycles that affect your hair; so even if you get away with carelessness in the short term, as far as your general health is concerned, your hair might not be so lucky. The second thing is to Improve Your Diet. Just because you face restrictions doesn't mean you can't eat foods that are good for your hair. Try to eat more beans, more dark green leafy vegetables and more seafood. This will improve the health of your hair follicles and can even help to stabilise minor thyroid problems. If you take thyroid medication, avoid soya. Finally, you can change the way you care for your scalp. If you experience itching or soreness, try using an anti-dandruff shampoo. Avoid blow-drying with hot air close to your scalp. Massage your scalp gently with your fingers at intervals during the day. It's especially important to keep it warm in cold weather, so consider wearing a hat. Just by taking these simple steps, you can manage the effect of diabetes on your scalp and can enjoy having healthy hair. With sufficient care, even lost hair may sometimes regrow. 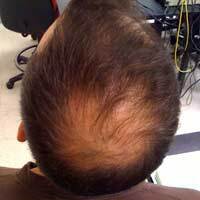 Find out how conditions such as Anaemia and Ringworm can cause hair loss in our articles on this site.